PSC organised a pre-season friendly for Wigan Athletic against Norwegian Champions Rosenberg. 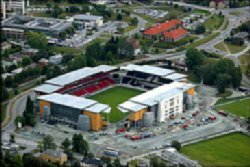 We organised a private aircraft for Wigan to fly in and out of Trondheim on the same day, and also were responsible for coach transfers in Norway and a pre-match meal for the team. The game was an excellent work-out for Wigan in their build up to their first Premier League game away to Newcastle United on 19th August and both Paul Jewell (Team Manager) and Bill Green (Football Co-ordinator) expressed their sincere thanks to PSC for organising an excellent trip for them.